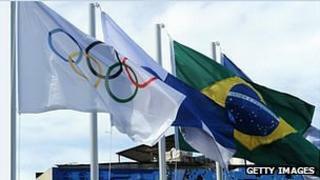 Two UK architecture firms have won contracts to assist with venue designs for the Rio 2016 Olympic Games. It came as a trade mission headed by Lord Sebastian Coe visited Rio with UK companies. Firm And Architects is teaming up with a Rio-based firm that has won a contract to design the handball arena. And 3D Reid, which worked on the Glasgow 2014 Commonwealth Games velodrome, has secured a position on the team delivering Rio's velodrome. It will work with local practice BLAC Architects as specialist venue consultants, advising local designers on the design development and delivery of the Olympic velodrome. The contracts follow a major initiative last summer during the London 2012 Olympic Games to try to win contracts for UK firms around the 2016 Olympic Games and 2018 football World Cup in Russia. It was hoped that the expertise gained in putting on the London event would give UK firms an edge in winning sport business contracts in the future. "We showed the world what we can do in London 2012 - now is the time to capitalise on this great success and the expertise so many British companies demonstrated in delivering the Games," said Trade and Investment Minister Lord Green. "UK firms are taking the initiative and thinking long-term by linking up with Brazilian companies, which is vital to winning contracts for Rio. "There are still many opportunities out there for UK companies to win business for Rio, new tenders are opening up all the time."